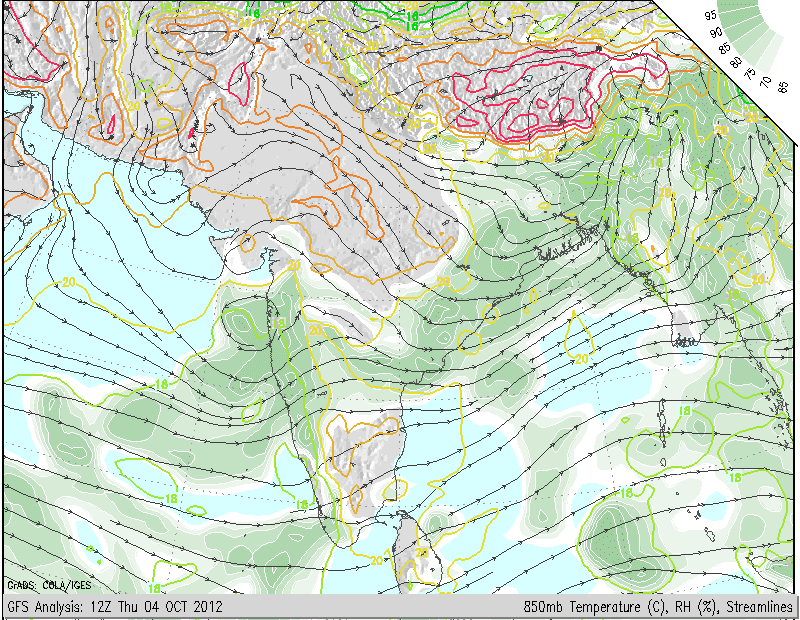 The UAC , almost at sea level(but not sea level) at 925 hpa, is centred few kms west of Mumbai. and shows the clouding in the NE segment, with the centre almost clear. (Explains some queries put up in comments and fb regarding the clouding shift to NE). Nearly all models do not foresee system in the Arabian Sea coming to sea level as a low. But seeing the tendency, i feel it may briefly become a low tonite, and remain SW off Mumbai. Otherwise it is strong as an UAC at 850 hpa and showing signs at 925 hpa also. Clouding is seen though not yet achieving heights.Likely to form thunderclouds within system by afternoon. Mumbai will see rainfall today late afternoon evening, with gusty winds, and thunder. Thunderstorms may occur and pockets of heavy rainfall will see ( by night) more than 50 mms. Mumbai will see extended thunderstorms till Saturday/sunday, with the system likely to remain in position till then... and Monsoon hanging around till Wednesday, 10th October at least. South Konkan gets heavy rains too. Interior Maharashtra will see the odd thunder storm in Madhya Mah region, but less than Wednesday. Urgent Posting if necassary at 3.30pm..
drizzle just stopped at borivali. Central N Mumbai like Santacruz, Goregaon, Kurla, Kandivili got heavy rains last night. As Santacruz have recorded 48mm rain ending 8.30am today. Colaba recorded 2.5mm & Badlapur(own measured ) 5mm. One of the rare days when I commute from a dry Panvel to a wet SoBo. @junaid just struck me that you are also an irfca ian and use ur vantage position over the tracks to give info. I travel to and fro in front of your society gates every day. Should catch up. Please share mail id so that v can exchange cell nos. Thank you Rajesh for blocking the Anonymous option. The difference is already felt in the comments section. On Wednesday night Kandivali(W) received 50 mm of rainfall from 9pm to 11.30pm with very heavy thunder storm. There was lightning and thunder every 2 sec. Rajesh different charts seem to indicate rains and thunder showers atleast till the 8th...are we getting extend monsoon stay.?? It has been a tradition that Mumbai has drizzles during Dandiya time !! Wondering whether the withdrawal phase wil stretch that far this time. while at my work place in andheri, also experienced heavy rains. rajesh sir , should we expect same weather from friday - sunday. As me and my family ,we are travelling to khandala for a weekend trip. what do u say rajesh , how the weather is going to be like. Lightening & Thundering started in Badlapur from ESEand now getting very dark also at 4.20pm . There was a lot of lightning with heavy thunder yesterday in Juhu from 11:00 PM onwards. Infact the thunder claps were much stronger as compared to Monday. Very heavy rains started in Badlapur now. something interesting... if you see the 10.44 and 10.59(UTC)mumbai radar close range images in sequence then the cloud movement seems to be from SW to NE which not what was happening last few days. any thoughts? Spoke too soon, the Doppler radar is up and running now, showing 11:00 UTC which is current. Hey sorry Tejas, didn't see your comment until I had typed mine. As for the cloud movement - I am not the best person, but I believe since the UAC is so close to Mumbai and the winds would rotate counter clock wise you would get a SW to NE wind movements. When the UAC was down below you would get E - SE wind direction. Again, Rajeshbhai could explain this much better. @ Tejas.Yes. Initially heavy rain arrived from ESE direction but soon in few minutes direction got changed from SSW now. And today less windy and lightening & thundering was limited before start of rains after rain started lightening & thundering are very few and that in big gaps. I think due to UAC coming closer to Konkan coast so change in pattern may have occur. After 15mins of very heavy rains now medium rain here in Badlapur. today from mornin cloud movement from south west to north east..but no rain has occured still..is thier any rain expected in Belgaum. Now started to open up here in Badlapur. So just drizzling now. 25mm rain measured in 50mins. In that first 15mins produced 15mm rain. @emkay please explain wat is an irfcain?nd my email id is junaidtaj13@gmail.com..
Btw panvel received moderate to heavy rain for half nd hour between 4 -4:35 pm! Now rain stopped. Very nice weather. As temp slide down to 26 C here in Badlapur. As I was mentioning yesterday that huge lightening were grounding in Ambernath with severe thunder sound and heavy rain over Amberanth only. So Rain data of yesterday clear shows it. & just 3kms NW in Ulhasnagar received just 3mm . And 8kms SE in Badlapur 5mm. @rajesh dunno why all my comments are getting deleted! Please put in any ID...comments section is not being scrutinised by me, but blog puts up with proper ID to avoid confusion like last few days....please continue with "dokebaaj if you like..
After heavy thunderstorm at 4.30pm now steady drizzling to medium rains in Badlapur from 15mins. No lightening & thundering this time . And coming from SSW direction. VABB 041440Z 11005KT 3500 HZ SCT018 FEW030CB BKN100 28/26 Q1008 NOSIG= "
@ Rajesh Sir. Nice explanation . Thats why Badlapur which is in ENE of Mumbai enjoyed the thunderstorm today evening. And anticlock wise winds send storm more NE of Badlapur that is till Kasara, Igatpuri & Nashik belt. As you explained center is clear so Mumbai near to center left out without any activity know ! Just Now lightening flashes seen in SW horizon.of Badlapur but no thundering & now light drizzling. sorry guys, the first map is removed as it was small, and all efforts by me to enlarge it failed..even with external link..
Karnataka - Bangalore gearing up for bandh on saturday-cauvery water sharing. Entire southeast karnataka absoulte drought- Not a single drop rain since sept. By the way right from june it was dry. Climate is like summer heat. Karnataka third consequtive year drought. Desertification???? Karnataka faced a rainfall deficit of 26 per cent at the end of the southwest monsoon. Against the normal rainfall of 835 mm, the State received 615 mm of rain from June 1 to September 30, according to the Karnataka State Natural Disaster Monitoring Centre (KSNDMC), Bangalore. While south-interior Karnataka received 231 mm (a departure of 35 per cent), north interior Karnataka received 329 mm (a departure of 33 per cent). The Malnad and coastal districts received 1,137 mm and 2,424 mm rainfall, a departure of 23 per cent and 20 per cent respectively. According to the Directorate of Economics and Statistics, only six districts — Chitradurga, Udupi, Shimoga, Dakshina Kannada, Bidar and Uttar Kannada — received normal rainfall during the monsoon while it was deficient in 23 districts. Chamarajanagar received only scanty rainfall. In Bangalore division, 35 taluks received deficit rainfall, in Mysore division it was 27, in Gulbarga it was 24 and Belguam it was 35 taluks. SWM made an exit from NWI at the right time atleast for Delhi-NCR i.e around 19sep but i can see that except NWI all other regions are still experiencing SWM.Really missing the rains. After seeing the radar IMD Mumbai immediately updated forecast for Mumbai just now and now saying THUNDERSHOWERS ACCOMPANIED WITH SQUALL AND LIGHTNING MAY OCCUR AT ISOLATED PLACES DURING NEXT SIX HOURS in city & suburbs area ! @ Rajesh Sir. As I have pasted an IMD's forecast in the blog if any blog rule violation has taken place then Sorry for it.. I feel like to paste IMD's forecast because for first time I seen there immediate response or seen so much active otherwise I always noted that there forecast is issued after actual event of weather has taken place ! Lightning started in S and SW, large drops drizzling also on (Mahalaxmi)..
rajesh sir since now the wind is from east(source:airport metar) should one assume that the UAC has moved slightly southwards? Rajeshbhai, what is the forecast for tonight, tomorrow and day after given the current position of the UAC? Is the UAC going to fade away / enter inland or move North along the coast? Yes. Rajesh Sir. Vagaries morning forecast copied by IMD. Now till Alibaug rain has started. Soon S.Mumbai may also get cover by rain now. Here in Badlapur now just light drops falling and no lightening seen at moment. Evening heavy thunderstorm rain & steady 2hrs drizzling from 7.30pm to 9.30pm both combined had produced 33mm rain here till 11.30pm. I pesonally calculate this UAC remaining in the current position, or shifting a bit west by Friday evening. I expect it to fade away, weaken , by Friday night. Mumbai will get showers with thunder by afternoon/evening,decreasing by late night. Saturday/Sunday much less, but a few localised thunderclouds drifting towards the city...more in detail tomorrow..
stations in Ratnagiri and sindhudurg districts received good rains today..devgad 25 mms till evening..
now some drizzle were passing in Belgaum..no thunderstorm nothin but only spray type rain is comming. drops drizzling. Having feeling like on Hill station. Temp also 24 C. Snap on vagaries FB. Now sky started to open up bit as some blue patches are seen in East horizon. Fog was clearing up now. @ Rajesh Sir. Observing from yesterday there is persistant big mass of cloud right from Vishakhapatnam coast , Bhubaneshwar to Kolkata & till Agartala in NE. Also looking big circular cloud around Vizag. Vizag got 9mm, Bhubaneshawer got 33mm , Kolkata got 49mm ending 8.30am today. So whether any system forming in Bay ? Or just temparory clouding ? 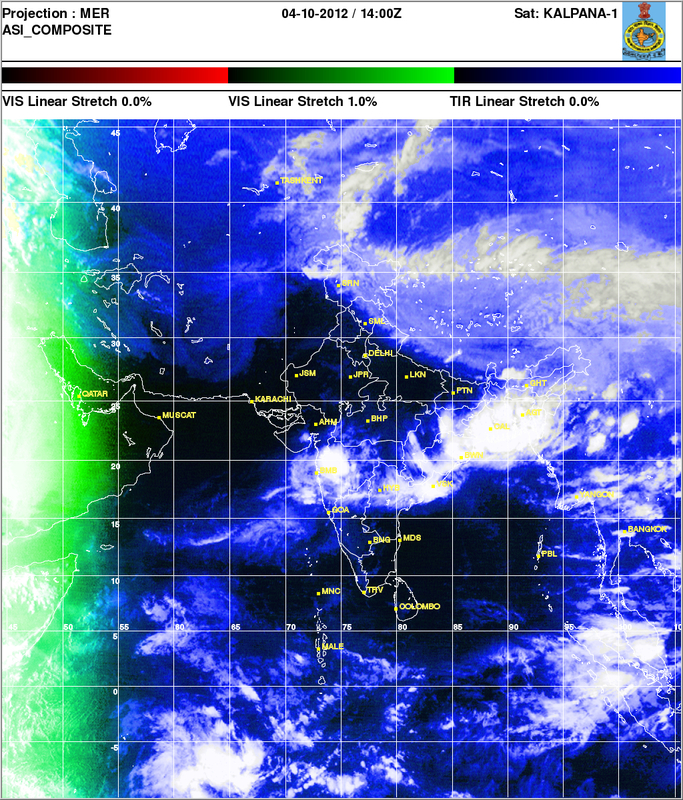 As was expected ,Here Arabian sea UAC given heavy overnight rain to South Konkan coast . Ratnagiri city got very heavy rain as 129mm rain measured there today ending 8.30. Harnai beach recorded 51mm rain today ending 8.30am.